Dream Catcher Charters is based from the Port of Rochester, New York. Your host is Captain Sam Zucco, who is a veteran of many years on the “Big Water”, and just plain knows how find fish for our clients. The fishing begins in earnest on Lake Ontario in April, when the Brown Trout fishing is the best of the season. Multiple-fish days are the norm in this period and Lake Trout, King (Coho) Salmon and the occasional Steelhead may also be caught. In June through Mid-July the Steelhead and Lake Trout are the predominant species, with the always spectacular King Salmon just beginning to appear. 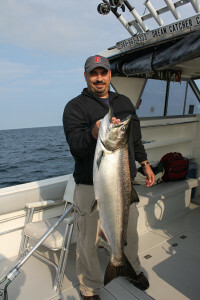 Mid-July brings fantastic action for everyone’s favorite the King Salmon with Steelhead, Lakers and Brown’s in the mix. King Salmon are the marquis species here and when at their peak, will wear you out by day’s end. Guests fish comfortably from a 30′ Penn Yan that is fully equipped with the very best in extensive electronics to spot the “big ones” and get you home safely. Her wide 12-foot beam makes for a comfortable and stable fishing platform for you to fish on and her hard top will protect your fishing party from the elements. She seats 8 people with plenty of room to spare. There is also a large standup cabin and enclosed facility for your privacy. A variety of packages are available ranging from 4 to 10 hour trips, with options for multiple days. Standard pricing is for 1-4 fisherman with additional pricing for up to 6 people. Lodging is customarily not included in the fishing packages. There are many nearby accommodations available and clients can arrange their own accommodations and simply pay for fishing. Fisherman must purchase their own license either online or at one of the many retail agents. Contact us today for more details!! References are always available by request. Let Fins and Furs Adventures and Dream Catcher Charters provide the experience of a lifetime with this world class fishery on Lake Ontario.